This week marks the return of actually having to do stuff. Tomorrow I have to catch the over ground to London Bridge (30 mins), and then I have to walk to the Northern line, have a minor panic attack whilst walking down steep escalators (2 mins), courteously join the human traffic taking place in a very tight, moving space and then attempt to get out at Kings Cross St Pancreas (20 mins). Walk (escalate) to the thankfully deserted and somewhat eery Piccadilly line, sit on that for another 15 minutes and arrive at Holloway Road. I am expected to repeat this process into university for the next year. Danny Dorling wrote in 'So You Think You Know Britain?' that Londoners endure the longest commutes. Something that I am pretty sure will happen in my final year at university is brownie making. Particularly devilish brownie making, brownies that will taste ten times better because I skived off uni to bake them. Why brownies? Because brownies wont allow the guilt of not walking to the over ground resurface. How? Most brownies happen in one large bowl which means you’re in and out of the kitchen in less than half an hour, that’s not enough time to start dwelling on that crucial bit of knowledge you’re never going to learn, but still paid for (not bitter). These brownies are not like the ones I’m going to make when I cant be arsed to go uni, these brownies are a send off to difficult recipes for 1 year. They required 3 bowls, a special trip to the supermarket for salty chocolate, and 2 attempts at the caramel. In fact, I don’t even think it’s acceptable to call them brownies, more like brownie flavoured fudge. This is a spin off of Paul a Young’s award winning brownie, which has the same texture quality as this recipe… something that suggests ‘fudge’ won the brownie wars against ‘cake’, perhaps? Make the caramel. Pour sugar into the centre of shallow heavy based saucepan and cook on medium heat until edges melt. Do not mix the sugar, instead gently shake the pan around to coat cooked sugar with raw sugar. Shake the saucepan around until a deep golden caramel begins to form. Remove from the heat and vigerously whisk half of the cream in, to stop the caramel from burning. Gradually add the rest of the cream until fully incorporated and then whisk the butter in - one small chunk at a time. Add the salt. Transfer to a bowl, cover and set aside to cool. Make the brownies. Line an 8 inch square tin with baking parchment and preheat the oven to 160 C. Dump the butter, sugars and syrup into a deep saucepan and heat until melted and glossy. Take off the heat and add the chocolate, stir continuously with a spatula until chocolate has fully melted into the mixture. Let cool for 15 minutes. Whisk in the eggs one at a time. Add the flour and mix until smooth. Fold in the chopped chocolate. Pour half the mixture into the tin. Spoon half the caramel on top of the mixture in little blobs all over the surface. Pour the rest of the brownie mixture over the caramel. Spoon the rest of the caramel over the brownie, this time take a knife and swirl the caramel into the mixture like this. Bake for 30 minutes. Leave to cool completely and then refrigerate overnight to firm up. Or, for a cakier brownie, bake for 50 minutes and leave to cool, no need to refrigerate. I met Alice of AlicesBakery at Broadway Market! She was so lovely and makes the cutest mini cakes adorned with microscopic macarons, now that’s some skill right there. The chewy caramel bits on the edges... these were amazing. Hurry up and bake something else please! I'm poorly and need cheering up... with sugar and carbs. These look good. As in insanely good. I'll take two please. I don't envy your journey, my morning scrum through Farringdon seems bad enough! I do, however, envy your brownies. They look so amazing. 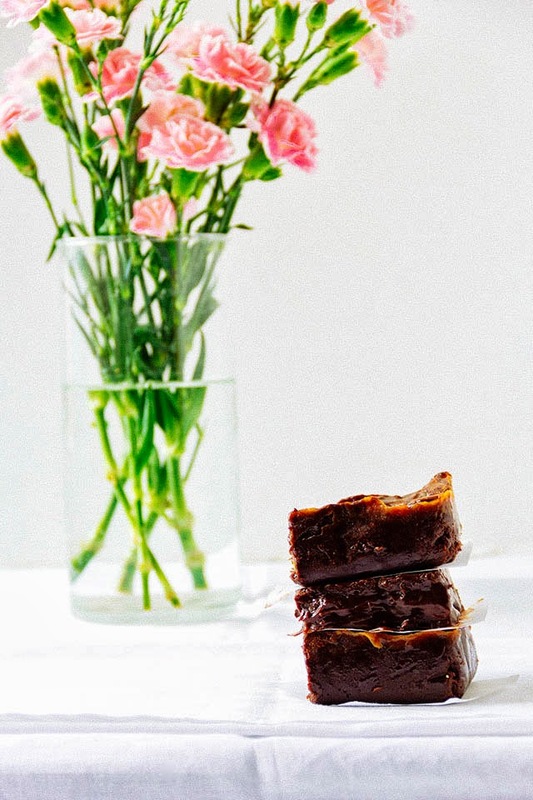 I remember being hugely excited when you first posted your dulce de leche brownies so needless to say I went YUMMMMMMMMMM when I saw the first picture in this post! They look so indulgently fudgy. 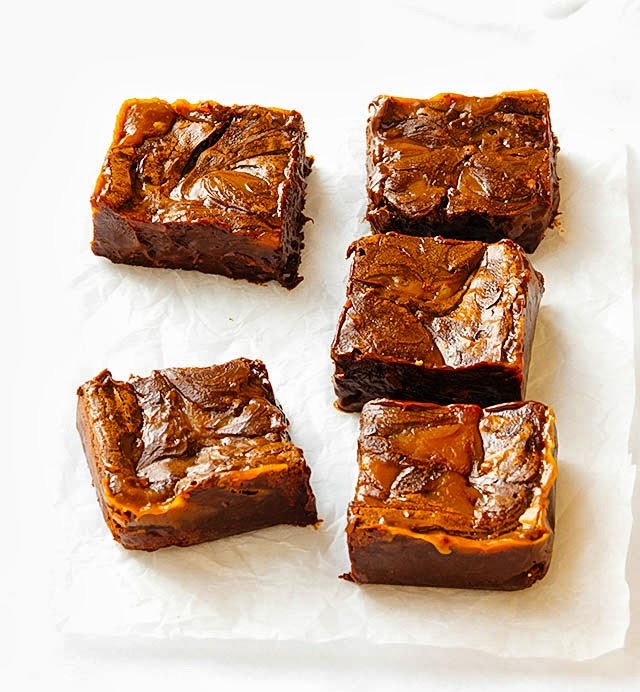 You'll definitely be needing brownies for such long daily commutes. Final year at uni saw me eating A LOT of chocolate digestives. My flatmate also baked an insanely good chocolate pudding. Basically, chocolate is essential in your final year! Thank you, you should deffo bake yourself a batch to keep you going! Gorgeous! These look too delicious! Perhaps you could tempt fellow commuters with these gorgeous brownies by wafting a tin under their noses...then they may move out of your way and be far more polite to their fellow travellers! hahaha, that or they would think i was a weirdo/trying to drug them ! Your commute sounds awful, I'm so sorry. Hopefully these brownies make up for it, or at least distract you from your misery...I love a very dense, fudge-like brownie though. It looks like you've accomplished the perfect texture here! Nora, you should see my face during this commute..you wouldnt want to come anywhere near me. whats the point of a brownie if its not fudgey hey? !